I have a bunch of cereal lovers in my house! 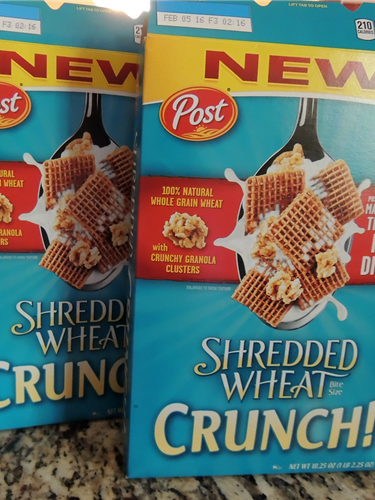 When I received these two boxes of Post Shredded Wheat Crunch, Simon wanted to try it right away and Dave asked if he could take a box to work! Both of them enjoyed the cereal and Simon especially liked the granola clusters! I too tried this cereal and I was impressed that it is not too sugary, but it still tastes great. If I eat cereal that has a lot of sugar, I tend to get shaky a few hours later. That did not happen when I ate this cereal. I eat my cereal with milk, but you can also use this cereal for a fun recipe – Chewy Shredded Wheat Crunch Granola Squares. Here is the recipe! Preheat oven to 325°F. Lightly grease 13 x 9-inch pan; line with parchment paper with 2 ends extending over edge of pan. Place butter, oil, sugar, corn syrup, honey and salt in medium saucepan. Bring to boil over medium-high heat, stirring frequently; reduce heat and simmer 5 minutes. Meanwhile combine remaining ingredients in large bowl. Drizzle liquid mixture over top, stirring constantly until well cooked. Transfer to prepared pan; pat down evenly. Bake for 15 minutes. Cool in pan 20 minutes. Holding both ends of parchment paper, life from pan and place on rack to cool completely before cutting into squares. Which way would you prefer this cereal – in a bowl or as granola squares?